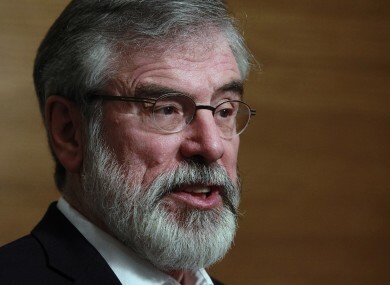 SINN FÉIN LEADER Gerry Adams has said that he is prepared to make a statement in the Dáil about allegations that he is withholding information about the IRA murder of a prison officer. Fianna Fáil leader Micheál Martin yesterday described it as “extraordinary stuff” that Adams would arrange a meeting between Austin and Oliver Stack and a former IRA leader who provided them with information about the murder of their father. Brian Stack (48) was the chief prison officer at Portlaoise Prison when he was shot while leaving a boxing match in Dublin in 1983. The father of three died 18 months later from his injuries. No one has ever been convicted over the attack that was carried out by the Provisional IRA. Austin and Oliver led a campaign to find out who killed their father. After being critical of the original investigation, the Stack family sought the help of Adams in order to find answers. Following that contact, Adams facilitated a meeting between them and a former IRA leader in 2013. In August 2013 I was able, with some difficulty, to facilitate a meeting between Austin and Oliver Stack and a former senior IRA person. The brothers were given a statement by the former IRA person which acknowledged that the IRA was responsible for their father’s death, that it regretted that it took so long to clarify this for them, that the shooting of Brian Stack was not authorised by the IRA leadership. Gerry Adams brought us in a blacked out van to see an IRA leader who he said he trusted and was a friend… This man told us that he knew who murdered my father, that the perpetrators were still alive and that one of them had been disciplined. The murder of Brian Stack was raised again during the course of this year’s general election campaign. In February, Adams said that Austin Stack had given him names of people who the Stack family believe were involved in the murder their father. I made it clear in my correspondence with the Garda Commissioner that I have no information on the death of Brian Stack and I have never at any time described those named as suspects. The email was only sent after I had spoken to three of the four. Only the gardaí can investigate this matter. Austin Stack has, however, denied that he provided Adams with these names. Speaking Monday evening, Stack reaffirmed that he “never gave any names to Gerry Adams”. Stack has now called on Adams to provide gardai with information about the IRA leader with whom they met in 2013 after it was facilitated by Adams. “This IRA leader clearly reported back to Adams as we were told on our way to the meeting by Adams that we would be getting an admission, so what did this man tell Adams and has he passed this onto the gardaí?,” Stack said last night. “Allegedly, Deputy Gerry Adams had the four names which he says he was given in 2013, but he did not tell anyone until February this year because the issue was raised in the general election. This is a murder. It is not about an election campaign or boxing clever in the middle of it,” Martin said. Deputy Gerry Adams knows more about this than I do. While the investigation into a murder is ongoing, perhaps he might use privilege to make a statement in the House to clear it up for everyone. Kenny also said that he intends to meet Austin Stack and that if accepted by Stack that meeting would be very soon. This is not the first time the leader of Fianna Fáil has used, in an opportunistic, a cynical and contemptible way, my efforts in good faith to assist the family of Mr. Brian Stack. I have dealt with the substance of the issue and if the Taoiseach wants to make space for me to do so, as he has indicated, I am prepared to make a statement here again. He is expected to make the statement at 5pm today. Email “Explainer: The conflicting words between Gerry Adams and the son of a murdered prison officer”. Feedback on “Explainer: The conflicting words between Gerry Adams and the son of a murdered prison officer”.